Happiness doesn't come from things you accumulate...it shows up when you begin to appreciate what you already have. I saw this on Twitter and it piqued my interest. The Tweet encouraged followers to create their own Happiness Jar for 2015, and the instructions seemed simple enough. Apparently, this idea comes from Elizabeth Gilbert, author of Eat Pray Love. 1. Find a jar...any jar...and decorate it any way you like. For me, it will probably be a note taped to the front of a washed out pickle jar with the words, Happiness Jar, printed as neatly as I can print them. Maybe I'll add a nice bow around the neck of the jar if I can find some scraps of ribbon. 2. Beginning January 1st, and daily thereafter, write one good thing that happened to you during that day. This doesn't need to be earth-shattering. In fact, something as small as "hot cocoa with marshmallows", "snuggling with my dog" or "I was kind to a stranger" will do very nicely. NOTE: if you miss a day every so often, don't beat yourself up. Just pick up where you left off. 3. Put the note in the jar. You can write your notes on paper you've designated especially for your jar if you like. I will probably put my notes on any scrap of paper I can find because I'm just not that organized. 4. Whenever you're feeling a little down, reach into your jar and pick out a random note to remind yourself of how blessed you are. 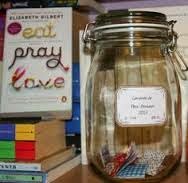 Some variations of this project might be to have a jar with each of your children's names on it and add a daily note sharing one thing you love and appreciate about them. You can also do this for your spouse or other special person in your life. After one year, you can present the jar to your child/spouse/friend to show you thought about them every day. If you're the crafty type, you could also make the notes into a collage before giving it to the person. One thing I know is we find what we're looking for. This project will cause you to look for some small piece of goodness each day. Who knows...looking for the good might even become a habit that you can't break.